Since 1999, each year, a group of Sullivan County individuals with a variety of backgrounds are selected to take part in a 10-month leadership training program. Class participants receive training on topics important to Sullivan County residents and businesses including education, health and human services, communications, government and politics, the environment, culture and recreation, economic development, leadership development and the judicial system. The Leadership Sullivan Program is a platform that expands leadership potential of participants through: educational programs designed to broaden individuals knowledge of the County, improve communication skills, and increase organization and problem solving skills. The program provides an opportunity to thrive in a culture that allows for the advancement of yourself, in addition to the well-being and advancement of those around you. Leadership Sullivan offers real benefits for you, and/or employee, and your community – to enhance potential, become better connected, and get smarter. Leadership Sullivan works toward developing informed and committed leaders who will apply their collective experience and skills to serve, strengthen and improve the quality of life for people who live and work in Sullivan County. The program is coordinated through the Chamber Foundation, and is a non-partisan program that relies on support from the business community to reach its goals. Visit www.leadershipsullivan.org for more information and how to be a part of the program! Don't know where to start or how to expand your business? Request free telephone, in-person, online counseling for startups and existing small businesses. Find free online workshops, forms, request a counselor 24/7 at SullivanCounty.Score.org. A public/private partnership established in 1994 to better serve the needs of relocating and/or expanding businesses in Sullivan County. To promote and coordinate the economic development of private business in Sullivan County in order to benefit the general public by enhancing the quality of life and improving the standard of living. 2) helping our existing businesses thrive through expansion and retention services. Please contact us at info@scpartnership.com or visit us at 198 Bridgeville Road in Monticello, New York. Make sure you visit us on line at www.scpartnership.com. The Visitors Association is the official Tourism Promotion Agency of the Sullivan Catskills and a full service Destination Marketing Organization. It is the mission of the organization to promote and support the Sullivan County Catskills’ natural, historic, cultural and recreational assets to optimize tourism revenue with a vision to be a premier multi-seasonal travel destination in New York State. SCVA is a membership organization that works with members to promote the Sullivan Catskills tourism industry to domestic and international markets. SCVA produces a yearly Travel Guide and several niche collateral marketing pieces. The Association additionally affords its members cooperative marketing opportunities and media stories in local, national and international publications adding earned value for its members. 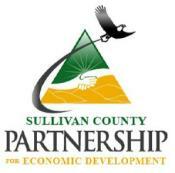 The County of Sullivan Industrial Development Agency’s primary goal is to promote economic welfare, recreation opportunities, prevent unemployment and economic deterioration, ensure the prosperity of Sullivan County’s inhabitants, and promote tourism and trade. 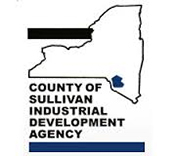 The County of Sullivan Industrial Development Agency (IDA) was created by an act of the New York State Legislature in 1970, as a public benefit corporation of the State of New York, under Section 906 of the General Municipal Law, to grant tax abatements and to help advance such projects. Industrial development agencies were created in New York State to attract and enhance industrial and economic development, help create jobs and maintain economic stability within municipal or regional boundaries. Because New York’s Constitution prohibits municipalities from making gifts or loans to private companies or individuals, the creation of IDAs provided a viable mechanism to accomplish commercial, recreational, and industrial development goals. Support of a healthy economy, the creation and retention of jobs, on a local, regional and State level is an important policy objective. The New York State Small Business Development Center (NYS SBDC) provides entrepreneurs and small business owners in New York with the highest quality, pro-bono, confidential business counseling, training, and business research. These are not just words to the SBDC. We work with real people and real businesses. Our assistance helps people like you achieve real success, as it has for 28 years.